Biting is a nasty habit in any dog, no matter what the size, so the best time to stop chihuahua biting is before it even really begins. Chihuahuas have a bad reputation for being snappy and irritable but they are not born that way. There are no bad dogs, just incorrectly treated ones. You can train a puppy not to bite and get an adult dog to stop if you do the right things. Before you attempt to stop chihuahua biting, you need to find out the cause of the biting. Teething. Puppies bite to relieve the discomfort of teething. Always provide plenty of appropriate chew toys so that your puppy can use them and not your furniture or your fingers. Keep a few toys in the freezer as they work better when they are cold. Whenever your pup bites something other than his own toys, simply replace it with a toy and make it clear that everything else is out of bounds. Lack of training. If you allow a puppy to bite and chew your fingers he will grow up thinking that this is perfectly acceptable behavior. Rather discourage mouthing right from the start to avoid having to sort the problem out at a later stage when it will be far more difficult. A consistent approach always works better than one where you are constantly moving the goal posts. Decide early whet you will accept and what you won’t and stick to it. Top dog confusion. Chihuahuas are easy to exclude from the canine family because of their inherent cuteness and size. They are easy to spoil and mollycoddle, when in fact they need to be treated as real dogs. This means making them understand that they are at the bottom of the pecking order. 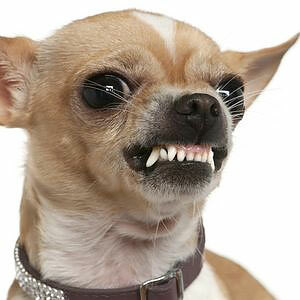 A biting chihuahua might be trying to assert his dominance over the pack, which includes you and your family. This situation is actually very stressful for a dog and should be reversed. One way of showing your dog that you are in charge is to turn him on his back whenever he bites. Do not let him get up until he relaxes and submits. Nervousness and fear. If your dog has been abused he might be biting out of fear. Only time, patience and a lot of love will overcome this sort of problem. Gently dissuade your chihuahua from biting by expressing your displeasure with a loud yelp, then saying “no” in a deep voice. Stop playing or remove yourself from the room. Don’t forget to encourage good behavior with lots of praise. Pain and illness. If your normally well-behaved chihuahua suddenly starts nipping and biting, take him to a vet. There might be a problem with his health that is causing him to bite. Chihuahuas can be delightful little dogs and do not have to be snippy and nasty. Treat them like dogs by respecting their canine instincts and stop chihuahua biting in its tracks.